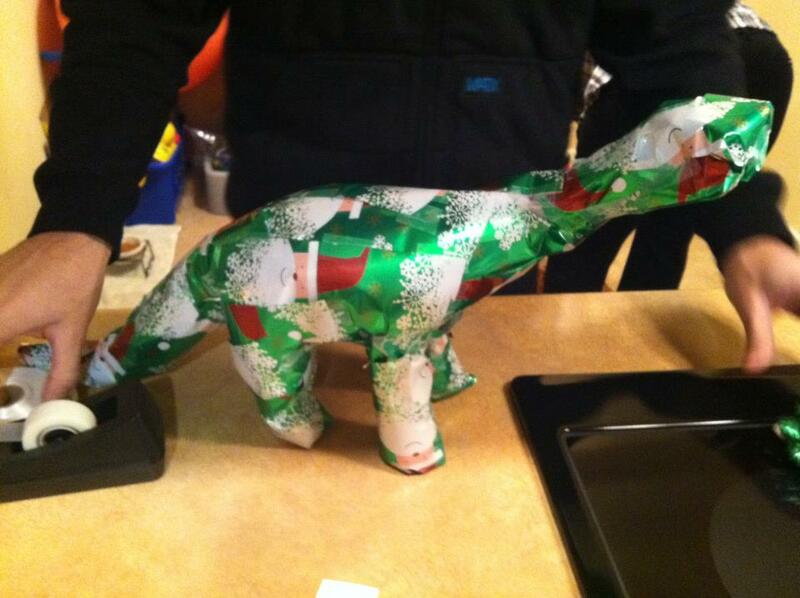 This is how Vanessa’s SO, Lane Medina, wraps a Christmas present. The young man shows promise! 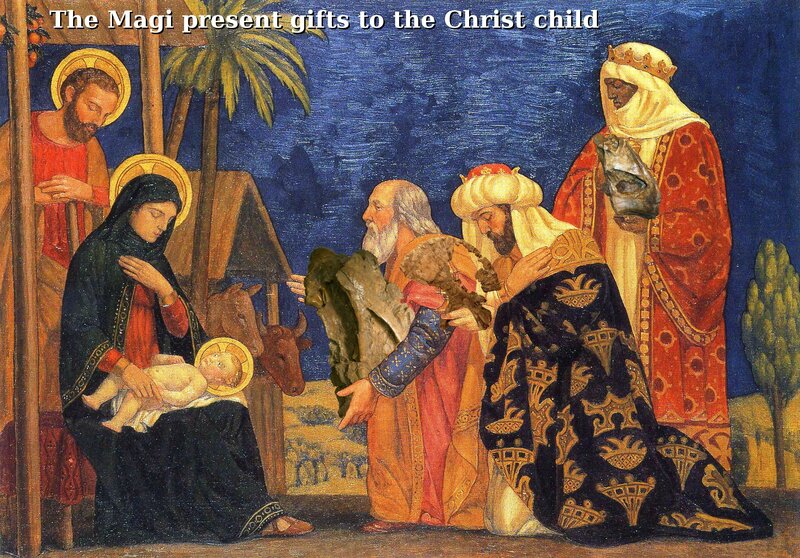 And a happy Christmas from me, too! And so we come, rather belatedly, to the fourth and final part of this series on preparing and giving talks at scientific conferences. If you’ve followed the previous installments, you should have figured out a clear, compelling story that you want to tell from your research; you should have clear slides with striking, relevant images and no visual distractions; and you should have rehearsed your talk so that it’s clear and coherent, and fits into the time available with a minute or two spare. Now we come to the business of actually delivering the talk. If you were paying attention, you’ll have noticed that I used the word “clear” three times in the previous paragraph — once for each of the three previous stages. That’s not by accident: the whole business of giving talks is about clarity, and that’s not going to change as we talk about delivery. Remember, once more, that your talk is one of maybe fifteen or twenty that your audience will hear that day: by the time they get to you, their brains will be half-frazzled. They will thank you (internally if not out loud) for leading them by the hand through your argument. You don’t want listening to your talk to be hard work. Remember, too, that you are the expert on your subject. Even if you’re a student giving your first ever conference talk, and even if the front row is full of Mike Bentons, Eric Buffetauts and David Normans, the magic of specialisation means that you know more than they do about your subject. They want to know what you have to say. And that leads us to Rule One, Rule Two, and Rule Three, which are so important that together they make up 90% of what you need to do to deliver your talk well. Here they are. So let’s look at these in order. First: speak up. It’s so simple that it seems almost insulting to mention it, but if people can’t hear what you’re saying, you might just as well not be saying it. Not everyone has a naturally loud, resonant voice, but that’s OK: conference venues will provide a microphone. Stay reasonably close to it — a foot or so will be fine. Many microphones are extremely directional, so make sure it’s pointing directly at your mouth, not past your ear or at your belly-button. If your natural tendency is to get quieter and quieter as you speak, have a friend sit at the back and wave at you if your volume falls too low. The best example I’ve seen of not panicking was at this year’s SVPCA in Lyme Regis. 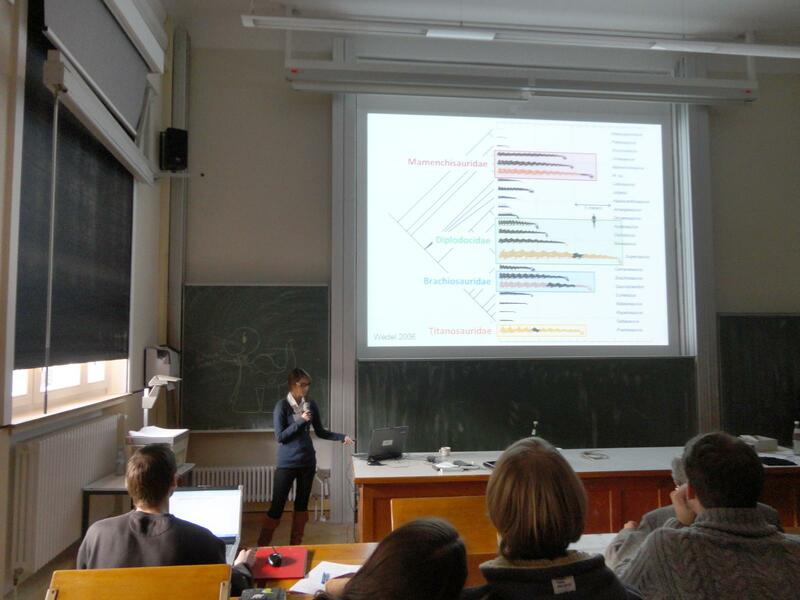 A student, giving her first talk, lost her thread completely and just stopped. It was a horrible position to be in and my heart — everyone’s, probably — went out to her. But she just stood still and silent for as long as it took (felt like twenty seconds but was probably more like five), thought hard about the line of her argument, then when she’d found the thread, carried on like nothing had happened. It was actually really impressive. If I remember right, she didn’t even apologise, and that is definitely the right way to go. The idea was just “I was gone for a moment there, but now I’m back; so ANYWAY …” Good stuff. When Matt prepares and gives a talk, he does it not by learning the talk itself at all, but by learning the source material, and by knowing his own work inside out. The slides then function (for him) as a visual cue, reminding him what to talk about next — even as they are also functioning (for the audience) as illustrations that support what he is saying. The specific words that he uses are made up as he goes along. (If real-time improvisation sounds hard, just think that this is exactly what you do every time you have a conversation.) I’ve heard Matt rehearse a talk the night before, then give it on the day, and hardly a word is the same between the two performances; but the substance is the same. By contrast, I have the impression that Darren prepares every word, and that if he gives that same talk twice it will be the same both times. That’s not to say that he won’t take the opportunity to throw in new comments that occur to him at the time; but basically I think he writes and memorises a script, which he then plays out when the time comes. Both approaches can work really well. 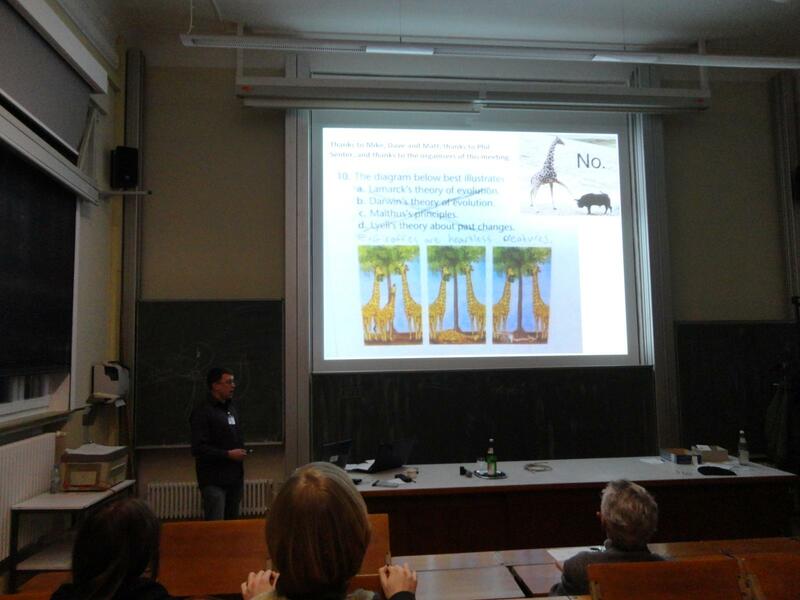 (They both did in the sauropod conference, where both Matt’s and Darren’s talks were outstanding.) Doing it Matt’s way can have the advantage of feeling more informal, and it gives you more opportunity to engage the audience non-verbally — eye-contact, responding to laughs, and so on. On the other hand, Darren’s approach lets you use the time more efficiently — you know you’re not going to waste time repeating yourself or going off on a tangent. It also means your running-time is more predictable, so you can keep cramming in more material till you get right up to the end of the slot. Personally, I use the first approach — I like the freedom of approaching each slide’s discussion in a way the reflects how people have been responding. Many students start out doing it the other way — probably because, in an intimidating environment, it feels better to be fully in control of content. Let me say again that neither approach is intrinsically superior — you should feel free to do it whichever way feels most natural to you, and that may or may not change over time. The one thing you don’t want to do is write a script, then not memorise it, so that you have to read it out from a printed copy. That’s a recipe for not engaging. All the time your eyes are on the printout, you’re not looking either at the audience or at the same images they’re seeing. How can anyone in the audience join you on your journey if you’re off on your own somewhere in a stack of index cards? Face the audience. It sounds obvious, but I’ve seen it not done. At the Bonn conference, the talks were given from a laptop sitting on a surface to the side of the screen. At one point in the conference, it got turned around so it faced more towards the screen than the audience, so one speaker gave her entire talk looking at the screen, with her back towards the audience. Straight away, bam, you’ve lost people. If they can’t see your face, you don’t come across as a human being. They might just as well be paging through a copy of your .ppt. You don’t need to say “This work is from my Masters project”, or from your Ph.D, or whatever it may be. Doesn’t matter. Your work will be evaluated on its content, not on what stage in your academic career you’re at. Some — no, most — of the best talks I’ve ever heard have been given by grad-students, or even on occasion undergrads. Some of the least engaging were by seasoned, even respected, professionals. Basically, once you’re standing at the podium, the playing-field is level. No-one cares about your status, they want to hear your ideas. 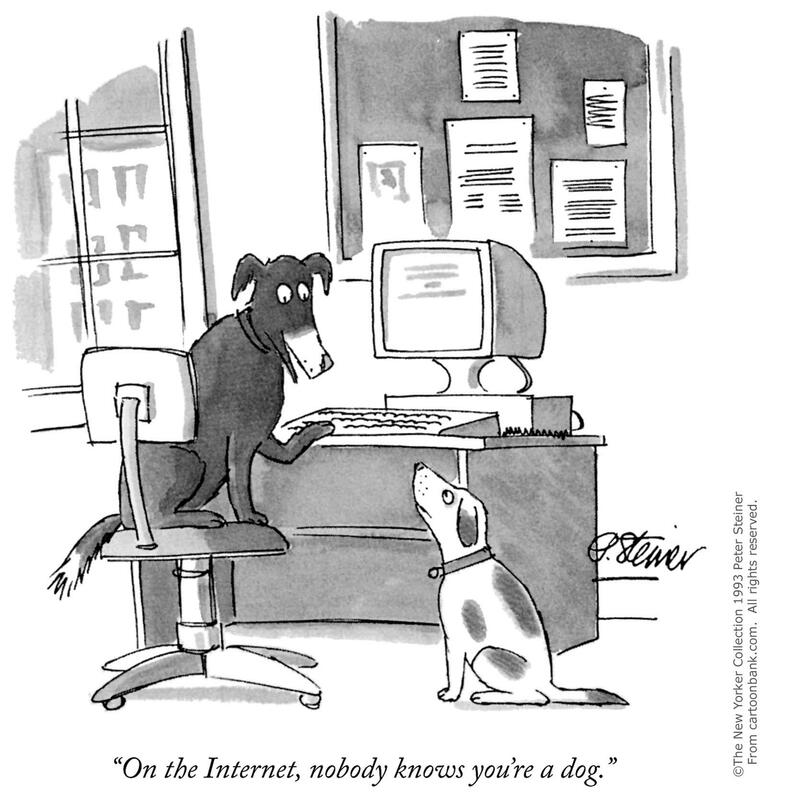 In academia, nobody knows you’re a dog. Leave the laser pointer alone. If you really need to point at something, pick up the laser pointer, point to it, and then put it down again. DO NOT WAVE IT AROUND. Do not circle it repeatedly around the feature of interest. These behaviours are distracting us from your talk. Don’t you want us to concentrate on your talk? Don’t read the slides out loud. We can read. If you say the words on the slide, we will be reading along with you; but because reading internally is faster than speech, we’ll be ahead of you, and frustrated that you’re not keeping up. You don’t want that. When you’re giving your talk on the subject that you know best out of everyone in the whole world, you don’t want to seem like the dumb one. The worst possible thing you can do combines both of the last two DON’Ts, yet I’ve seen it done more than once. The way you do it is, you slooowly read the words off the screen while tracking each word as you say it with the laser-pointer. About two slides of that is enough to make the audience want to gnaw off their own heads so they won’t have to see any more (or, if they are clearer thinkers, gnaw off your own head). Finally, a time-saver. 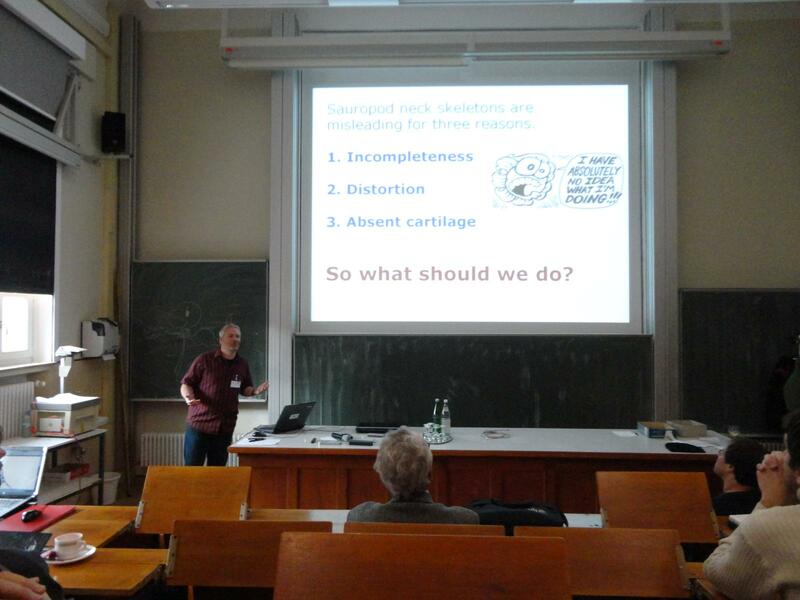 Many talks finish with a summary slide and an acknowledgements slide. Both are very wordy and take a long time to read. So don’t. Skip the summary completely — we should be able to remember what you told us only fifteen minutes ago. And don’t read the acknowledgements — just put them on the screen as you finish, and people can read them as you take the questions. Not too much to say about this. The questions at the end of talks fall into a few categories. — Someone doesn’t understand something you said in your talk and wants clarification. Just explain. It may be worth going back to the slide in question. — Someone wants to demonstrate that they know a lot about your subject by commenting on an esoteric point. Sad to say, yes, this does happen. Quite a lot. Best just to let him (it’s nearly always a man) get it off his chest, acknowledge the point, and move on. — Someone has useful information for you. This is the best kind of “question”. 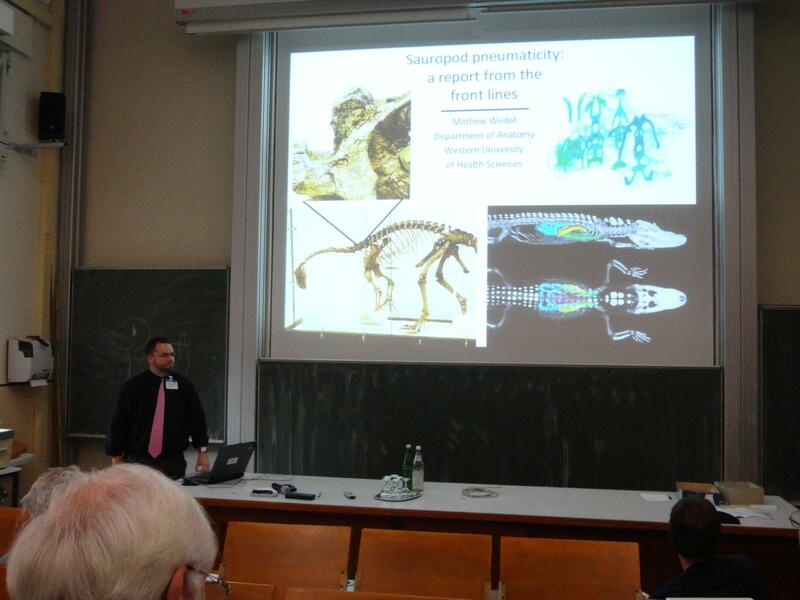 For example, at the end of my Bonn talk, Phil Manning happened to know the relative thickness of the cartilage between the cervical vertebrae of a hadrosaur mummy, and threw that in. Very useful. — Finally, someone might have spotted a real flaw in your work. This is rare — after all, you’ve been working on this stuff for months or years, and the audience are only just hearing about it for the first time — but it does happen. In this case, it’s probably best to say as little as possible, beyond acknowledging the issue, and save the deep thinking for later. We’re used to seeing animals develop more elaborate crests and other display structures through ontogeny, but in the sequence you’re proposing here, the cranial ornamentation becomes progressively less flamboyant. Do you know of any extant animals that follow this ontogenetic trajectory? There is much to be said for such economy. I hate to destroy the elegance of Mike’s ending by tacking something on, especially since he let me do an editing pass and I had a chance to get this in before he published. But it’s important, and it’s not worth a post of its own, so here goes. Please don’t say at the beginning of the talk, “I hope in this talk to convince you that…”, and likewise don’t end the talk with, “I hope by now you’re convinced that…” Blecch. This is just gross and lame, for several reasons. Reason 2: It’s not your job. You’re there to talk about your science, not how the audience should feel or think about your science. So don’t pull people out of the talk by talking about the talk (another reason never to apologize for the talk during the talk). Get out of that meta-level and tell your story, simply and directly. Or quit and go into marketing. Reason 3: It sounds pathetic. You absolutely can affect your audience, but you do so by connecting with them, being responsive, and above all knowing your stuff and presenting it clearly. Telling the audience that you hope that they’re convinced is pleading, plain and simple. It makes you sound weak, and corrodes your credibility. Just don’t do it. Hot on the heels of PLoS ONE-like open-access megajournals such as BMJ Open, Nature’s Scientific Reports, the Royal Society’s Open Biology and SAGE’s SAGE Open, now the king of evil predatory price-gouging publishers-whose-business-model-is-to-prevent-papers-being-read Elsevier are — you won’t believe this — launching their own PLoS ONE clone, FEBS Open Bio. So please join me in giving a hearty “meh”. I don’t see how this can work. Surely the only reason people ever send their work to Elsevier journals rather than somewhere truly open is because of the reputation that individual Elsevier-owned journals have accumulated over the years? No-one sends to Cretaceous Research because it’s published by Elsevier, do they? In which case I don’t see who is going to submit to a brand new Elsevier journal just because it’s Elsevier’s when PLoS ONE already has the momentum and (increasingly) the prestige. So I am not predicting a bright future for FEBS Open Bio. And that suits me fine. Success should go to people who went open because it was the right thing to do, not to for-profit publishers who are belatedly realising that the world has changed and scrabbling to make the best they can of it. Oh, and by the way: a little bit of searching shows that FEBS Open Bio not actually Open Access. Its User Rights page says that “articles are protected by copyright and may be used for non-commercial purposes”, and goes on to give a long list of things that you’re not allowed to do with FEBS Open Bio articles. As Peter Murray-Rust points out, it’s not Open Access if it has the “non-commercial” clause, which has all sorts of undesirable consequences. 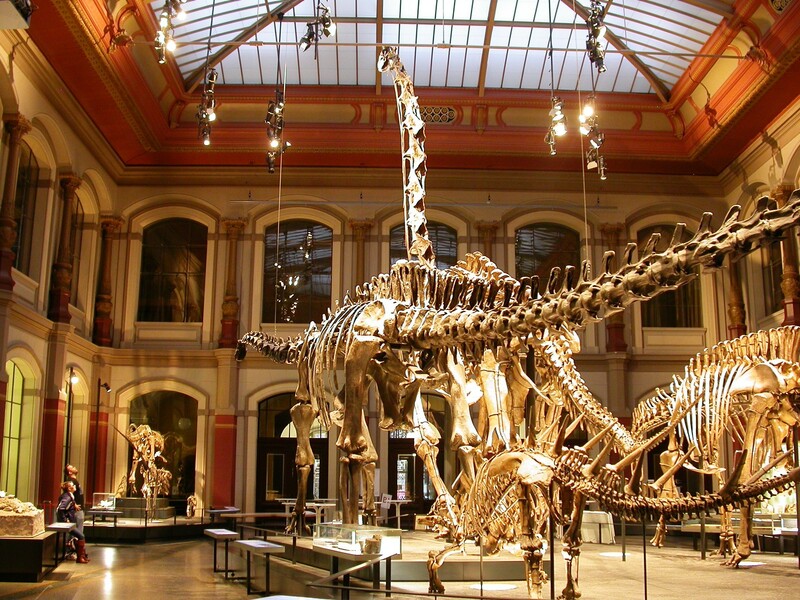 This year, I missed The Paleo Paper Challenge over on Archosaur Musings — it was one of hundreds of blog posts I missed while I was in Cancun with my day-job and then in Bonn for the 2nd International Workshop on Sauropod Biology and Gigantism. That means I missed out on my annual tradition of promising to get the looong-overdue Archbishop description done by the end of the year. 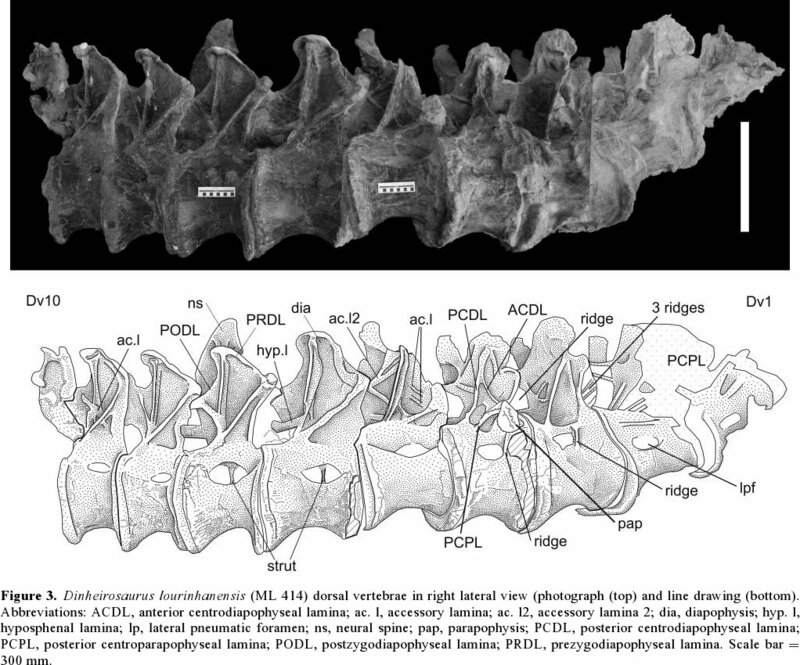 Brachiosauridae incertae sedis NMH R5937, "The Archbishop", dorsal neural spine C, probably from an anterior dorsal vertebra. 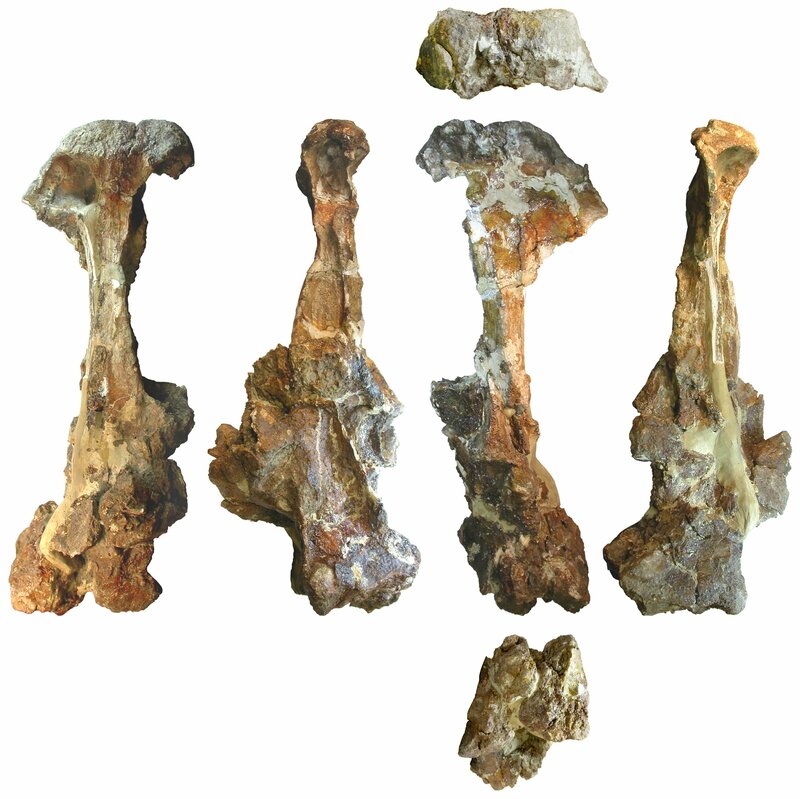 Top row: dorsal view, anterior to top; middle row, left to right: anterior, left lateral, posterior, right lateral; bottom row: ventral view, anterior to bottom. But this year, Matt and I are going to have our own private Palaeo Paper Challenge. And to make sure we heap on maximum pressure to get the work done, we’re announcing it here. Here’s the deal. We have two manuscripts — one of them Taylor and Wedel, the other Wedel and Taylor — which have been sitting in limbo for a stupidly long time. Both are complete, and have in fact been submitted once and gone through review. We just need to get them sorted out, turned around, and resubmitted. We’re going to be realistic: we both have far too much going in (incuding, you know, families) to get these done by the end of 2011. But we have relatively clear Januaries, so our commitment is that we will submit by the end of January 2012. If either of us fails, you all have permission to be ruthlessly derisive of that person. 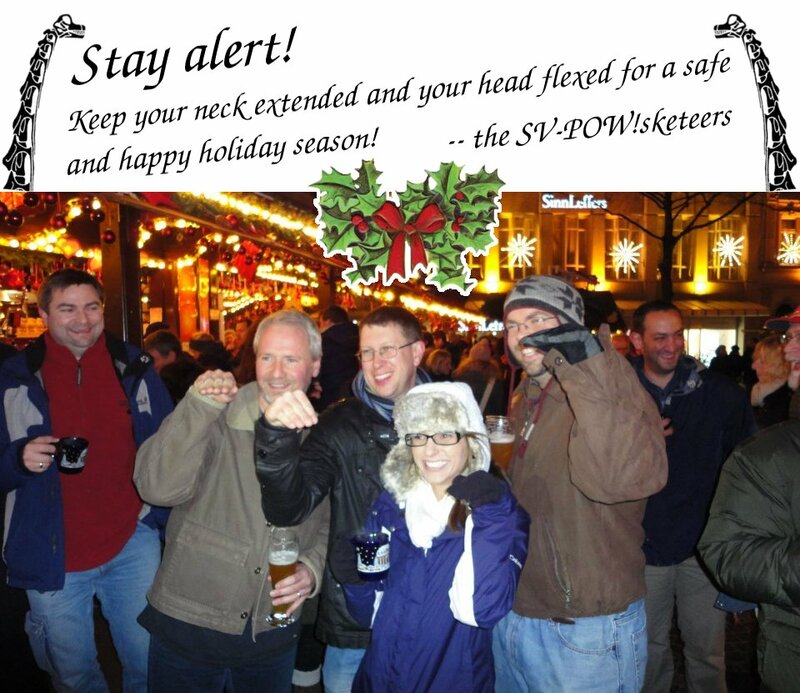 Some time while we were all in Bonn, the SV-POW! hit-counter rolled over the One Million mark. Thanks to all of your for reading! Wedel lab group photo, December 12, 2011. Vanessa Graff and Mathew Wedel, with Diplodocus carnegii, Giraffatitan brancai, Dicraeosaurus hansemanni and assorted stinkin’ theropods and ornithischians for scale.